Unit from Smithsonian multidisciplinary ocean curriculum. 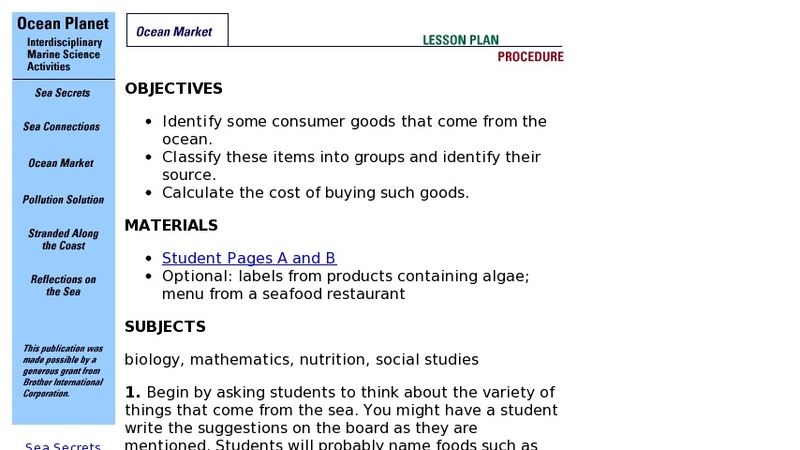 Lesson plan focuses on foods, materials and medicines that comes form marine life, how these resources are harvested and processed and the impacts of fisheries. Students identify and classify consumer goods from the ocean and calculate their cost. Unit includes: background essay; teacher instructions; forms for student activity; discussion questions; all online in PDF format. Resources include online version of Smithsonian Ocean Planet exhibition.